Dimension: 17.25" x 12" x 8"
We have gained a huge appreciation in the market by offering an excellent array of Leather Portfolio. space for writing pad & pen. With the aid of our diligent workforce, we have been able to provide an optimum quality assortment of Document Leather Portfolio which is available in diverse sizes and designs. 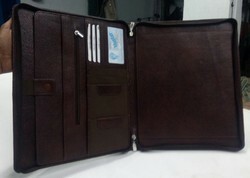 We are one of the leading manufacturers and suppliers of Leather Portfolio, which is made using high quality leather in compliance with industry standards. With the support of our designers and craftsmen, we are offering various designs, colors and sizes in our range as per client’s requirement. Moreover, we fulfill the bulk order of our clients within a given time line. >Two digits combination lock on FLAP. -->Two TABS with Buckle on Round Button. -->Two zipper, Two open inside.